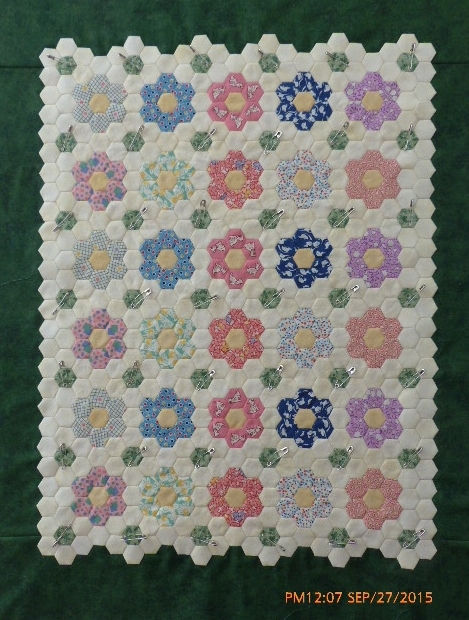 I have now finished appliqueing The Grandmother’s Flower Garden to the background. I was writing a blog on The Quilt Show when I was putting this miniature together. For all intents and purposes, those blogs are gone forever. I now save my blogs to ensure against loss. 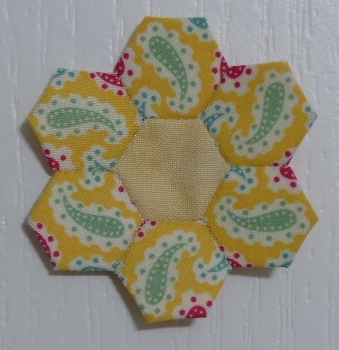 Anyway, I’ll back up just a little to show how to put a hexie flower together, no matter what the size. 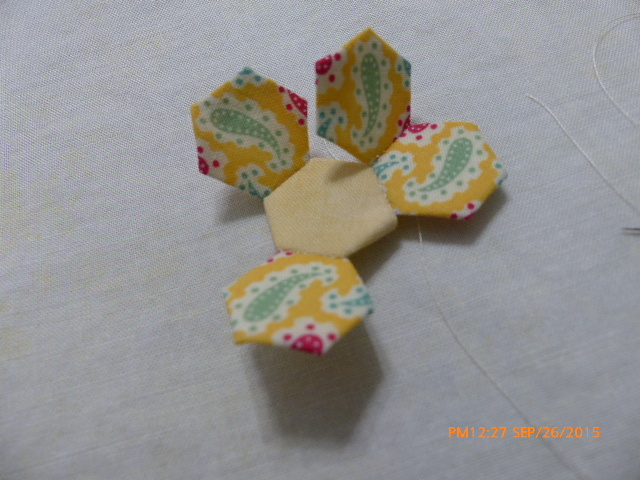 I start by adding three petals to the center. 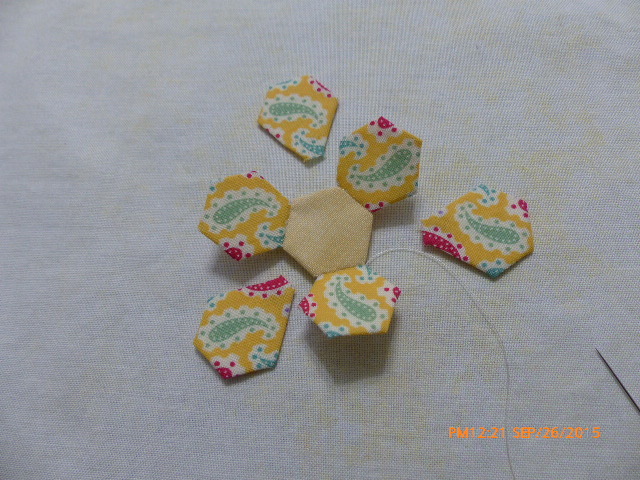 After this, you can fill in the last three hexies by starting on the outside edge and sewing the three sides without breaking your thread. 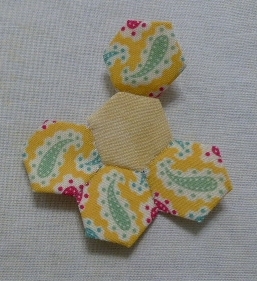 After adding two more petals in this manner, you will now have a completed hexie flower. Sweet. When I started this project, I used cotton thread–don’t ask me why because using silk thread hides the stitches so much better, which is what I used to applique this project to the background. 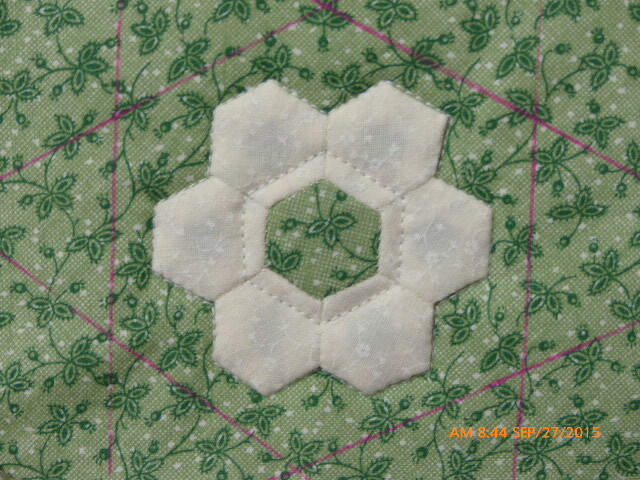 I decided to practice quilting on just one flower. 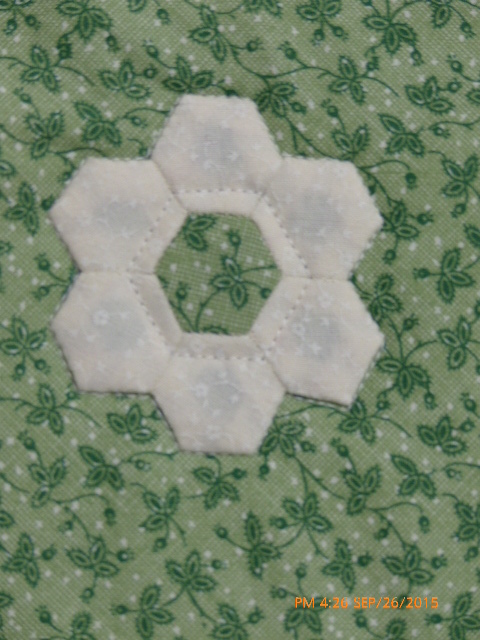 I just stitched around the center hexie using the edge of my open toed applique foot (Janome F2) and 2.2 stitch length. 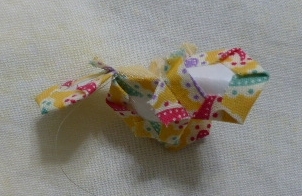 This is what I’ll do to quilt this project, after layering with a thin batting like Thermolam. On my sample piece, I marked some lines with a Frixion pen (marks will disappear with a hot iron) and then just echo-stitched around the entire piece. After finishing the edges, this can be a mug rug. 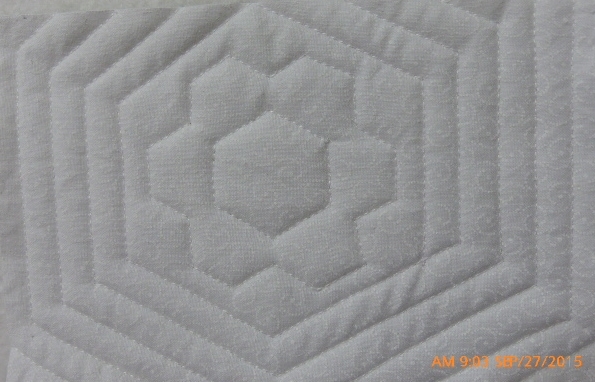 This week I will layer this project and start quilting. It’s a great feeling to near the end of another UFO. Tomorrow I’m going to run away and take some pictures of the Jamie Wyeth exhibit at Crystal Bridges. That and the Andy Warhol Nature Exhibit will be closing October 5. In the meantime, Hwy 71 is Thunder Road for the next day or so with the end of Bikes Blues and BBQ in Fayetteville. The count was 400,000 last I heard — some mighty cool bikes and riders out and about. Safe journeys home, all. 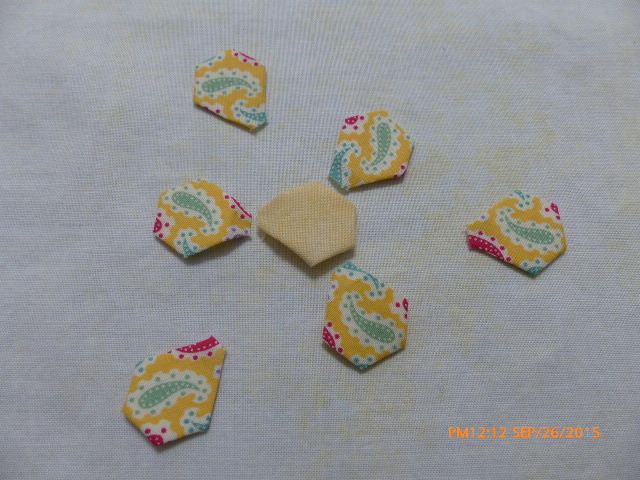 Posted on September 27, 2015, in English Paper-Piecing and tagged Andy Warhol, applique, Bike Blues n BBQ, Crystal Bridges, Frixion, hexie flowers, Jamie Wyeth, quilting, The Quilt Show, Thermolam, thread. Bookmark the permalink. Leave a comment.